This cafe often caught my attention while biking along Ilica street; the glass walls reveal the beautiful interior, as if inviting passers-by to enter. It’s a relative novelty (it opened in July 2017), but after my first visit I immediately knew it would enter my personal list of favourite cafes, and it really did. 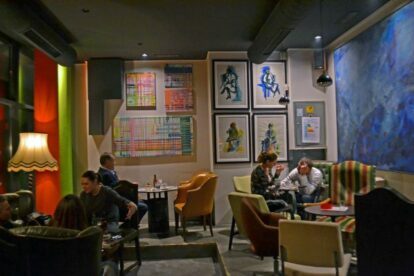 The cafe looks like a gallery or a salon – the walls are lined with paintings, the furniture and lamps are antique, and a piano adds an extra touch of refinement. All this creates a perfect atmosphere for long conversations over a cup of tasty Hausbrandt coffee or Lipton tea. And the cafe perfectly fits in with the neighbourhood, considering its proximity to the Art academy and Britanski trg with its antiques and collectibles fair. The phrase “kak se šika” comes from old Zagrebian jargon: its approximate meaning is “as befits the occasion”. Today this phrase has an old-fashioned connotation, as something our grandmothers would say. The owner is an academically trained painter who wanted to create a special space which would be a gallery and cafe at the same time. The paintings are all her own works, and even some of the furniture comes from her personal collection. Weekends are reserved for live music: “after-work” jazz piano on Friday afternoons and a guitar on Saturday evenings. Other programs include a very popular “Talent show”, talk shows and cultural events. It’s a place for savouring – for your palate, as well as for your eyes and ears.